Now, here's an old GUI I found from a long, long time ago. Venturer is a very simple GUI with some functionality. Unlike a few GUIs I reviewed that didn't even have a usable interface, Venturer looks like it was an imitation of Windows 95. 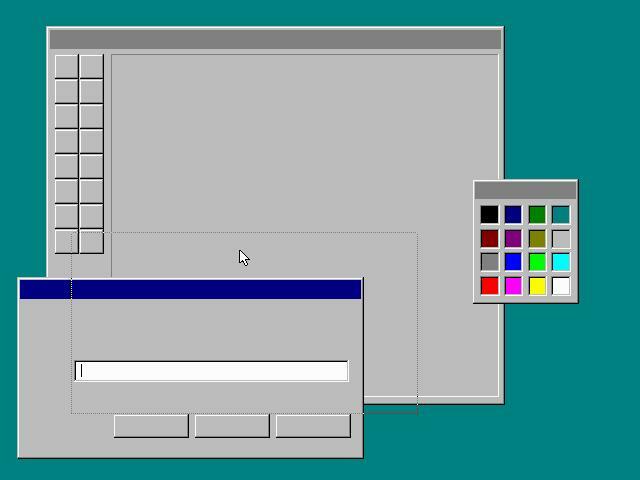 Two windows look like the old Paintbrush program in Windows 95 and the top window resembles the "Run" window when accessed through the Start menu in Windows. As you can see, no fonts or text are displayed. The windows can be dragged and dropped and buttons can be clicked. That's basically about it. There's no information about the author, the GUI, nothing - except the GUI executable. It's unfortunate since this GUI looked pretty neat and was one of the earlier GUIs I fiddled with for inspiration.